Luxman celebrates its anniversary with special edition valve amplifiers | What Hi-Fi? Are you a hi-fi hipster? Need a bit of retro-chic in your life? Luxman hopes so, because in celebration of over 90 years of production the company is releasing a special-edition valve preamp and power amp - the CL-38u SE and MQ-88u SE. 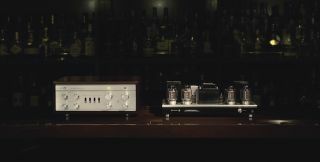 The CL-38u SE (on the left in the picture above) has been made to evoke the design of the company's 1970 CL-35 control amplifier, but with an updated skill-set: the special edition has multi-function tone control and phono equaliser, switches for mono sound and low-cut control (to minimise low-frequency turntable vibration), and a remote control. Inside, the preamp has the ECC803 and ECC802 valves from Slovakia JJ Electronics, four MC cartridge step-up transformers, and a SRPP (Shunt Regulated Push Pull) configuration to deal with awkward amplifier loads. Joining the preamp is the MQ-88u SE, which is based on the MQ-60 stereo power amplifier. With KT-88 valves in a triode-connected push-pull circuit, the MQ-88u SE delivers a power output of 25 watts per side through Class A amplification. If you want to get your hands on one of these limited-edition amplifiers - only 100 of each will be made - they are available now. The CL-38uSE will set you back £4000, while the MQ-88uSE is £4500.